Many artists will tell you that it all starts with an idea and then a sketch. 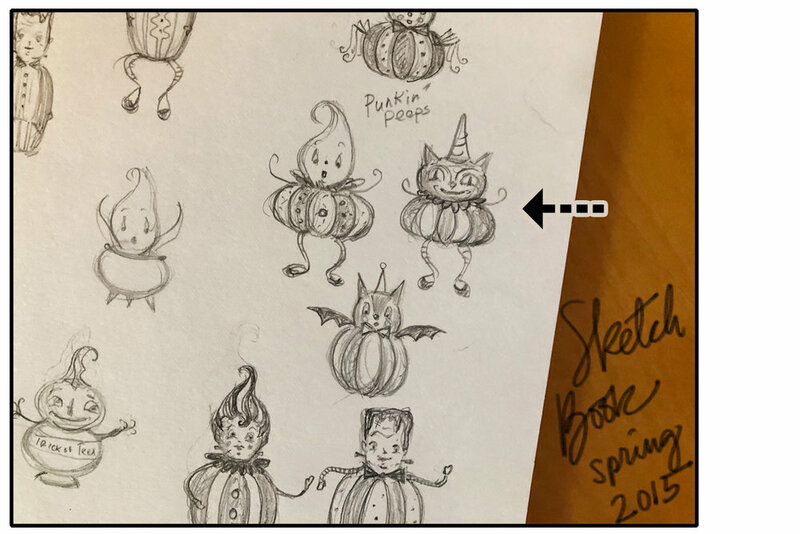 Same goes for me...From a page of rough concepts, I'll pick my top faves and refine the illustrations from the pre-chicken scratch phase to something that I feel comfortable sharing with a licensee. Depending on my mood and time of day, I may illustrate my ideas with ink, water-based dyes and colored pencil, or create them straight from Photoshop using various brush tools, or a mix of the two. If it's late at night, I often opt for the latter because let's face it ~ at 1 am, it's easier to just sit at the computer (with the screen dimmed, mind you) and start drawing stuff vs. getting all my supplies out and starting a project, well, at 1 am... Yes, I'm a night owl.. Above is a cluster of Halloween characters that I scanned from my sketch book and then roughly colored in Photoshop. Visually, it helps to present them all together to see how the characters play off of each other in a collection. You can see that the black cat now has some color! Once the visuals are tightened up a bit closer to what I have in mind, I'll format a page expressing what a collection of characters could look like. I pull the elements together, add some text, and then send them off to my licensing contacts! With fingers crossed, I wait and hope for positive feedback. Timing is crucial, and sometimes I just nail it while other times, I miss my window of opportunity, or I'm just way off target. That's life. If it's a miss, at least I have the art for a future opportunity. I have drawers full of those, just waiting for their big day. If several days go by, and no enthusiastic replies flood in, chances are, it's a no-go. That's just been my experience. On the other hand, a quick reply can mean a big YES, and we start brainstorming from there. Every once in awhile , there are also those magical times when I thought all bets were off, and a favorable response appeared weeks to months after its submission. We can always wish for those surprise nuggets of news as well. Moving forward after interest is expressed, the licensee will often ask for more supporting designs that help create a cohesive collection. I try to do that at the start, but the product development team may take the ideas a different direction or perhaps broaden the designs to other materials and categories, especially after a year has gone by and response has been favorable. For example, if I submit ideas for figurines, a return request may evolve to making those characters into ornaments, plates, mugs, plush and beyond. More work for me, but also more skus. I've been licensing my work since 2004, and the resounding message from the various companies I have worked with is that a larger collection creates more impact. From personal experience, a small handful of pieces will indeed get lost in a showroom full of things. You need to make a big splash! I love this, and I hate this. More pieces equals more exposure and more goods to offer folks, but it's more work and more time dedicated to building a licensed collection. There are no guarantees that the designs provided will make the cut. 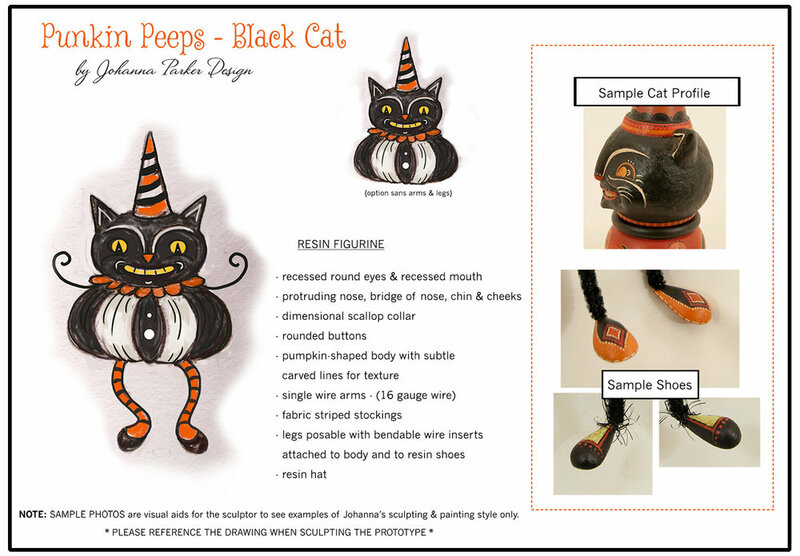 Initial artwork for my black cat "Punkin Peep" shelf sitter... 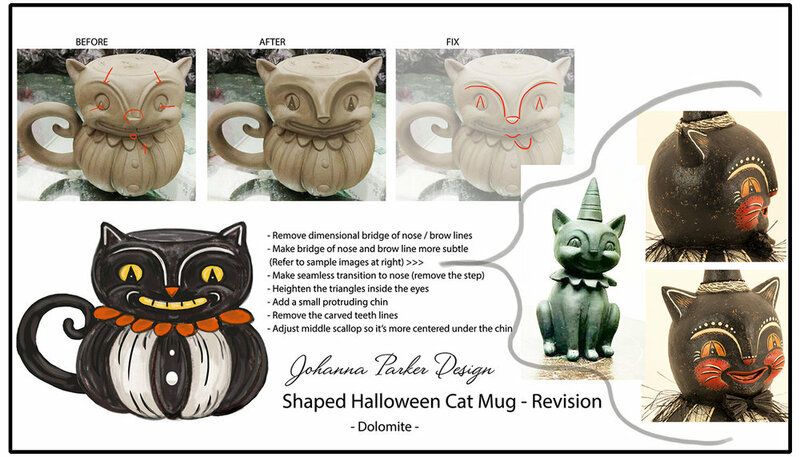 It was from this guy that the black cat mug was inspired and developed a year later. A quick before and after, from rough illustration to final product which debuted in 2016...I'm thinking that I like the figurine better than my sketch. Gotta love that! Once we have settled on a group of product designs, the art needs to be shared with the manufacturing factory team to get the process in motion. In the majority of cases that relate to my figurines, there will be a communication barrier. So, I create visual aids for the overseas sculptors to review. I will develop a page for each character with titles and a brief description. Sometimes I will add photo excerpts from past work to capture similar profiles as examples and to help express 3 dimension. This is just how I do it and not necessarily at the request of the licensee. They ask for artwork, and this is what I provide. Text is included for the translators, but visuals are key. I will often include a rough profile and backside sketch, submit the graphics to my licensee and then await the clays. 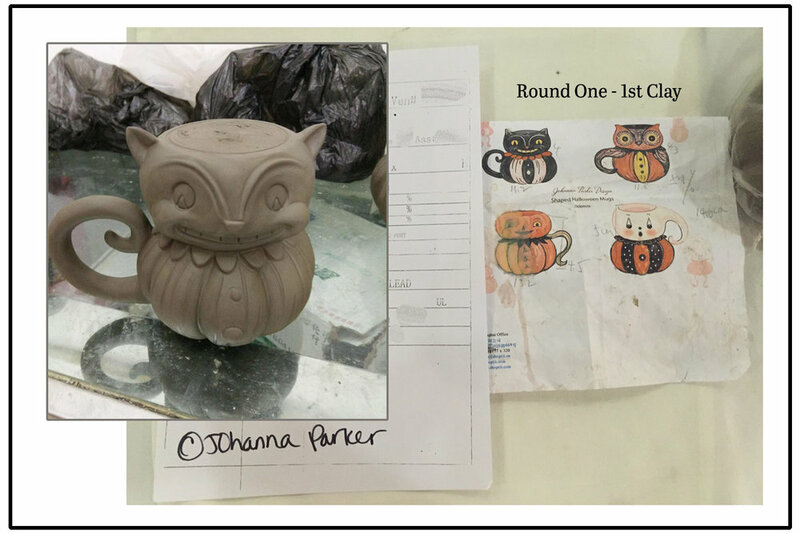 Emailed photos of my designs in clay often arrive within a couple days, but rarely capture the design just as envisioned. In that case, I will make a "Fix-it" graphic with more visuals, showing the before and after along with a few red lines to indicate the changes I would prefer to see. This alone is many hours of work, but it's a detail that I feel is critical in capturing the spirit of my characters. When I have omitted these steps, the finals are just not "me." So, there is a bit of back and forth, and sometimes a lot, to refine each product. When satisfied or at least closer to my vision, the clays are molded, and the prototypes are produced. Through years of experience in licensing, I have realized that it really helps to be more engaged in the process, so that the final product resembles the vision. Years ago when I started out with other companies, I was not given the opportunity (or perhaps I failed to ask) to see or comment on the process. Nowadays, I am grateful to be more involved in the development of each design whenever possible. Round One Fix-It Graphic - I often create my "after" image in Photoshop, using the factory photo as a base and then paint over it in the same tonal clay palette with my revisions. The "fix" image is a screened back version of the unaltered factory photo with red lines over top, indicating the changes. Round Two - 2nd Clay... A few things were looking off still, including the funky dip in the chin.. So, here comes another Fix-It graphic. Yes, my black cats are dear to me, so I was extra particular about this guy. Round Two - Fix-It Graphic included the chin detail as well as reshaping the profile of the nose. When possible, I ask for a profile photo. There are some hidden details that can be completely missed from only a front view. Round Three & Four: I probably could have skipped this step, but I really wasn't loving his subtle buck teeth. It's just not a feature that I give my cats if I can help it.. hehe! From here, we move on to paint, and in most cases, I will receive emailed photos of the painted protos for approval before production ensues. I much prefer this in case the colors are off, or details are missed, and that's often the case. Who better to catch this than the artist who designed the art? Once all is approved, production commences and samples are made. From my experience, maybe a dozen or so samples of each design are produced and sent to the licensee for their reps to cart around to the various buyers' market shows. The licensee's design team will photograph each sample to display on their website as well as for future catalogs. So, this handful of samples, that have likely made a long journey across the ocean, need to look their best! A lot weighs on these little guys, so it's a "handle with care" kinda situation. If they arrive broken, well, we can pretty much kiss those guys goodbye, at least for that year! So, the big market season is at the start of each year. Buyers for stores who have a budget for these annual events will travel in to Atlanta, NY, Vegas, Dallas, etc.. to attend and see the latest products for themselves. A lot weighs on these markets. Licensees are looking for feedback and obviously orders. This is where the big collection vs. the small grouping can really boost sales and attention for an artist's work. We hold our breath and hope for a positive response, a flock of excited buyers, attracted to our displays, and well, you get the idea. But all in all, orders need to be taken. If the order count is low for any item after a series of shows, well, that piece gets cut. The factories have their quotas for production. So, let's say 500 pieces need to be made to get a certain price break and only 300 orders were written at market, there is a risk for the licensee. I'm not privy to all of these details and decisions made about ordering my product. But, I can safely assume that if an item is dropped at the start of the year, its early orders didn't meet the quota. 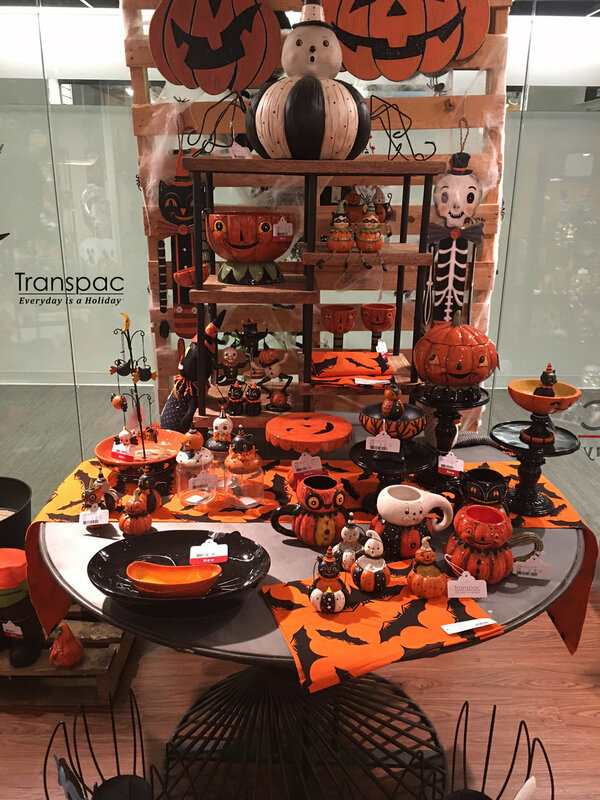 Quick snap from my January 2018 Halloween display in Transpac Import's Atlanta Showroom. I am not involved in this phase of the design process, so I cross my fingers that the displays will be eye-catching. The majority of the items grouped together here are my designs, minus the textiles and the large jack-o'-lanterns hovering over the scene. My Black Cat Mug is in the mix, albeit a bit tricky to see from this angle. Speaking of, some of you may have noticed that I have been sharing new product photos on social media (mostly Instagram) at the start of this year. I know some folks don't want to see Halloween & Christmas in January & February, and I've had my share of unfollows for it, but here's hoping it helps to remind our shop friends of what's new for this year and to consider placing their orders now.. We so appreciate it, and our collectors will thank you for it later! With all that said, I've spelled out the steps from my experience to help explain the process from idea phase to tchotke shelf collection :) It takes about a year+ from initial sketch to product in hand. At that point, once the items are exiting stores, wrapped in tissue in shopping bags, the artist begins to receive royalties. So, it's not for the impatient at heart. It's a waiting game for all aspects, including the compensation part. So, why do I do it? Well, we have built a hearty following for my collectible art. Our folk art originals, as special as they are, are just that. We can only make so many each year, and then a new year begins. They take countless hours to create, and each is unique. But, really, we're only reaching close to a hundred or so collectors each year that actually are in the right place at the right moment to adopt them. And, many thanks to those dedicated people! The rest of you who wish for a taste of our style in your home are eager (or so we hope) to snag a reproduction or two or more for your collection. That's where the licensed designs come into play. In this case, through licensing, we are now able to offer my designs in ceramics and other new mediums too! Typically the price is right, and although we may have to compromise on quality and detail, we can connect with so many more people through larger production. I know, that's pretty obvious, but sometimes I have to remind myself of the obvious. It's a choice that I continue to make because I have this innate drive to share my talents with you. Excuse my cheesiness, but it's true. Making art for myself and stashing it away feels incomplete. I have this need to connect the dots and fill the void. It's a lot of cyclical work, but we do find joy in your enthusiastic response! That in turn creates the momentum for the next round. 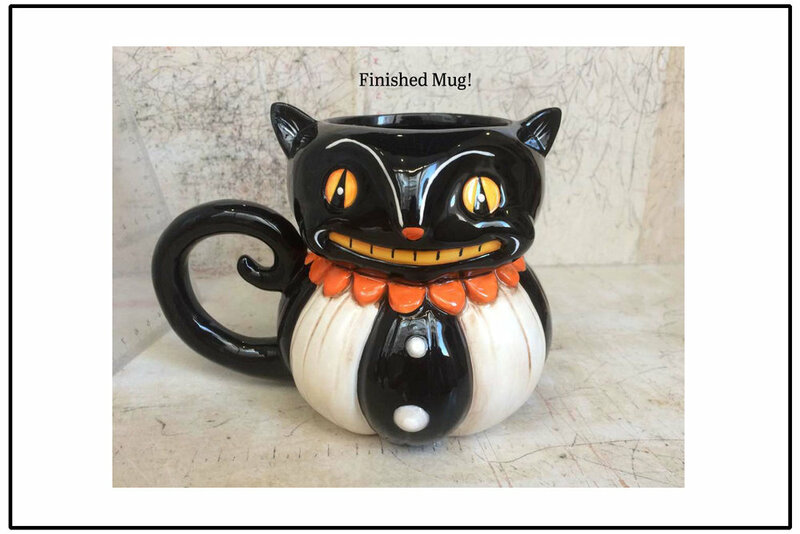 Sharing some photos where I was tagged on Instagram by fans who were thrilled about their new Johanna Parker Design black cat mugs... Your enthusiasm is contagious! Well, I hope this post answers some of your questions about my product development in the field of licensing. Perhaps it's interesting at least to those that are familiar with our work! So, thank you for taking the time to read it, and thanks to Transpac for granting us the thumbs up to share the steps with you. I often receive questions about the process, and I feel this is an easier way to share my answers, all in one place for whomever wishes to visit. Let us know if you found it helpful or interesting by clicking the heart below. If there are other related topics that you would like me to cover in the future, feel free to leave your thoughts, future product suggestions or questions in the comments section below, and I'll do my best to respond to you. Type your message in the Comment box below this post (you may need to click on the "Comments" text link first to activate the box) - Click Preview if you wish - Then, Click "Post Comment" - Add your name to the short form that appears next, but you can leave the other boxes blank - Then click "Comment as Guest" - Folks are having trouble commenting - sorry it's confusing. PS - If you have a Squarespace website, you can log in to leave a comment.